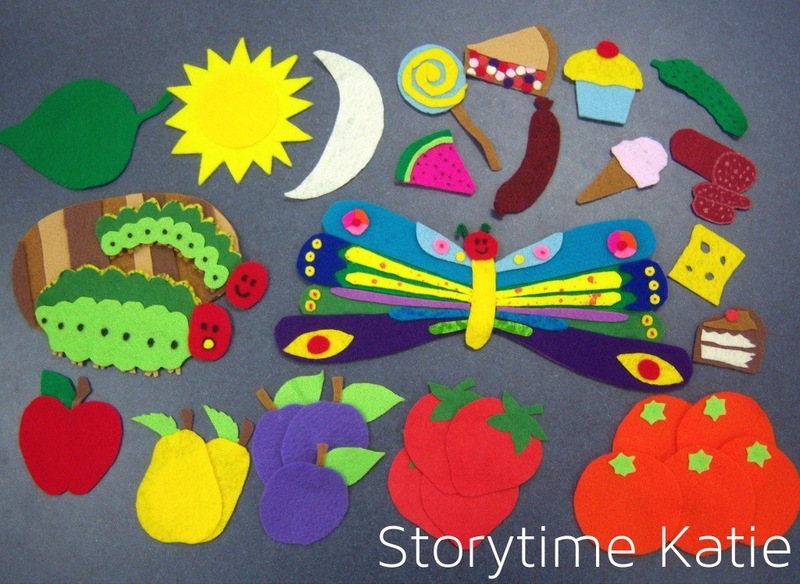 Another storytime craft brought to you by Pinterest, originally from Blissfully Domestic! I had the teen volunteers pre-cut and pre-glue these, the kids at daycare colored them in. These crafts were IMMEDIATELY hung up in their classroom and the kids kept checking the window to see if the weather had changed so they could move their clothespin, haha! You want to know how to wow a group? Bring out a pop-up or action book. The kids sat awestruck when “Maisy’s Wonderful Weather Book” was pulled out. I had to do the actions three or four times before they were ready to move on to the next page. Also, the kids loved telling me how wrong I was when I was doing the watermelon match-ups! Ack! This storytime post got lost in my queue — this was weeks and weeks ago at this point! I started off storytime with “Ella Sarah Gets Dressed” by Margaret Chodos-Irvine. This is a super cute book about a little girl who has made up her mind on exactly what she will be wearing! Every family member tries to suggest a more reserved outfit, but Ella Sarah will not yield! This one elicited a lot of laughter from parents, and I prompted the kids several times, “Do you like Ella Sarah’s outfit?” and one little girl said, “It’s the most beautiful I’ve ever seen.” Clearly a winner with both! Next up, I read “New Socks” by Bob Shea. While this is a wonderful book, and I am totally in love with it — I’m not sure that the kids really knew what was going on. I think that this book would work much better as a one-on-one book instead of a group read. But that’s storytime! You learn as you go sometimes. After our first two books, I whipped out my flannelboard of “Froggy Gets Dressed.” Instant hit, folks! Hysterics all around when everyone realized that Froggy forgot his underwear. And I had one little boy ask his mom if he remembered his underwear that morning. Thankfully, he did! And then it was on to “Too Purpley” by Jean Reidy. 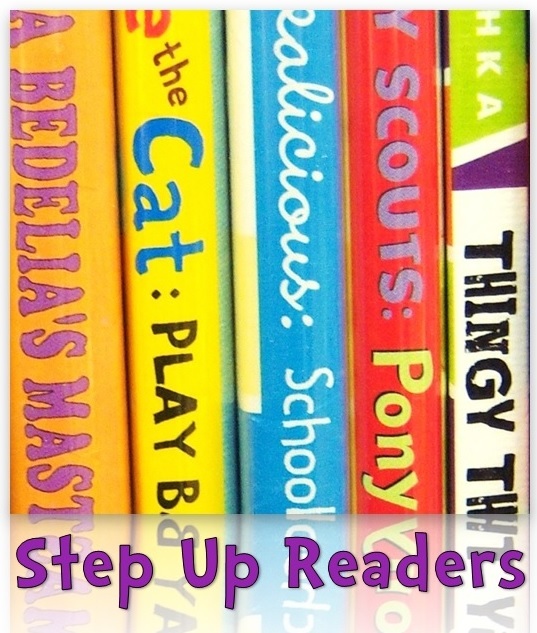 I used this book in “Purple” storytime earlier this year, but had to use it again for this storytime! There’s tons of different kinds of problems with this little girl’s clothes. This storytime session’s favorite page was the page with lots of tags — apparently I have a lot of kids who hate tags, and a lot of parents who wanted to point that out! The kids were REALLY good at playing this one — they were very careful to examine all their pieces of clothing and their shoes before standing up. Afterwards, we read “Bear Gets Dressed” by Harriet Ziefert. The last book for the day was “Polly’s Pink Pajamas” by Vivian French. This book was a big hit because when I pulled it out I had a little girl proclaim that it was her favorite book! Well, you know that when kids endorse something, everyone is immediately interested in it. It was a great way to end the program. Afterward, it was time for our craft! I got this idea from the Best Kids Book Site. My teens cut out the clothes and the kids colored and strung them on the yarn clothesline. I thought this was a great idea and that the kids would really be able to be creative with their clothes. I had several kids who colored the clothes they were wearing that day! I did this program last year right around this time, and thought I would post it so that other librarians and libraries could use it! I knew that most of the kids attending this program had likely read the book prior to signing up. At first I was going to combat that by using the pop-up version to add a little twist. But then, I discovered flannelboard templates online and the rest was history. My favorite piece is the butterfly wing! I did a ton of painting to get it to look at close to the book’s illustrations as I could. After the flannel (which was a HUGE hit; I had a lot of kids “reading” the story along with me), we sang a little song with our pretend butterfly hands. Fly high up in the sky. For my kids, I modified by allowing hands to help the balloons and pairing kids up instead of making teams of three. I had a lot of younger threes/fours at the program and knew that the game would be too difficult. And then, I did two different crafts with the kids! •	Glue pom-poms onto one side of clothes-pin. Twist 3 inch piece of pipe cleaner around top end to form antenna. Let dry. •	Lay paper towel flat. Mix water and food coloring to make “paint.” Use paint brush to paint the paper towel. The more colors you use, the more colorful the butterfly. Allow to dry. When dry, fan fold the paper towel into approx. ½ inch sections. I actually did the caterpillars ahead of time, using hot glue and making sure that it was nice and dry for the kids. And I SO did not want to mess with food coloring with preschoolers, so I wound up using watercolor paint. It worked just as well, with way less mess! Use fingerpaint to make a caterpillar crawling across the bookmark. Add legs, eyes, and mouth with a black marker when dry. Hole-punch a hole at the top of the bookmark and tie a ribbon through it to finish it off. I called each child up one at a time while they were watercolor painting and had them dip their fingers in fingerpaint to make the bookmark. Instead of taking each child to the sink after their turn — I used hand/face wipes from the store. Another way to simplify my life! Then, while their butterflies and their bookmarks were drying, we played one more game! Cut butterflies out of cardstock and then cut them in half. Hide them around the room and ask the children to help you match up the butterflies. 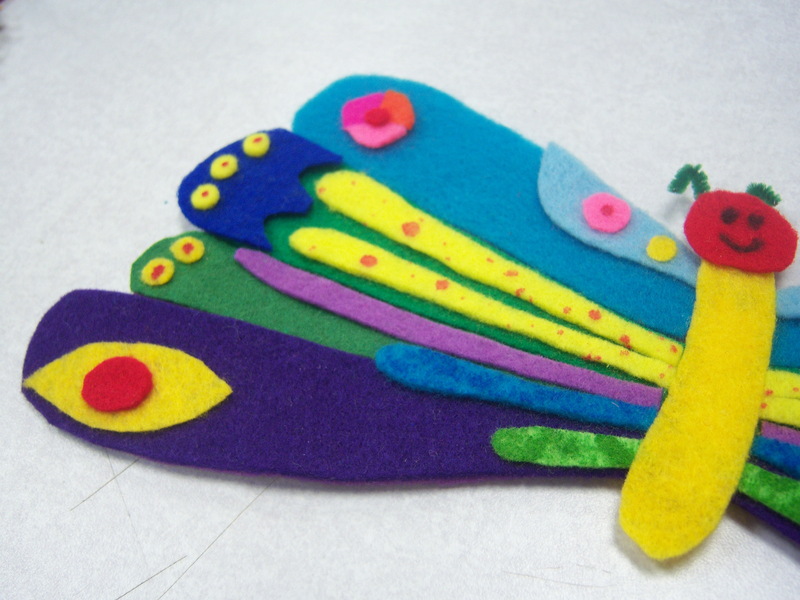 Afterwards, each child got to keep the butterfly they matched up and took home both crafts. This program was a really big success as far as I’m concerned, and I had a lot of pleased parents leaving the programming room that day. For whatever reason, during this session we have a ton of little boys! Ten boys to six girls, which is really different from what I’m used to. I’m finding that I need a lot more action rhymes/songs to get those wiggles out. Anyway, I decided to cater to my boys and do a dinosaur storytime! We started off with “The Littlest Dinosaur’s Big Adventure” by Michael Foreman. I wanted to start off storytime with a quiet one instead of going straight into roaring. I also liked that this story was just about dinosaurs, and didn’t have any people in it. A lot of the books that I previewed were about dinosaurs living with people — which isn’t bad, just not exactly what I wanted. Next, we practiced some shapes with “Shape by Shape” by Suse Macdonald. I did our flannelboard & song next — “Ten Little Dinosaurs” — which is just the tune of “Ten Little Indians” and dinosaurs. And then we did this action rhyme that I found this poem by Nancy Klein on The Childrens Museum of New Hampshire’s website. And then we read my favorite dinosaur book: “Dinosaur Vs. Bedtime” by Bob Shea. While we did enjoy roaring with dinosaur, this one did require a little bit of explanation at the end. The kids weren’t really sure what had happened — why dinosaur had stopped roaring. I had to explain that dinosaur was sooooo tired from roaring that he went to bed! I love this book’s colorful images and vivid dinosaur destroying scenes. Next, I got to use our brand-new storytime mitt and dinosaurs shapes! So incredibly happy with this purchase. Five funny dinosaurs letting out a roar. Four funny dinosaurs munching on a tree. Three funny dinosaurs didn’t know what to do. Two funny dinosaurs having lots of fun. One went away, and then there was one. One funny dinosaur afraid to be a hero. He went away, and then there was zero. And finally, we finished up with “I Dreamt I Was a Dinosaur” by Stella Blackstone and Clare Beaton. I love Stella Blackstone books. They have simple, rhyming text and always really colorful pictures. This book was done with felt/sequin pictures and is such a great settle down book for the end of storytime. One of my little boys laid down on the rug and put his hands under his head for this one. 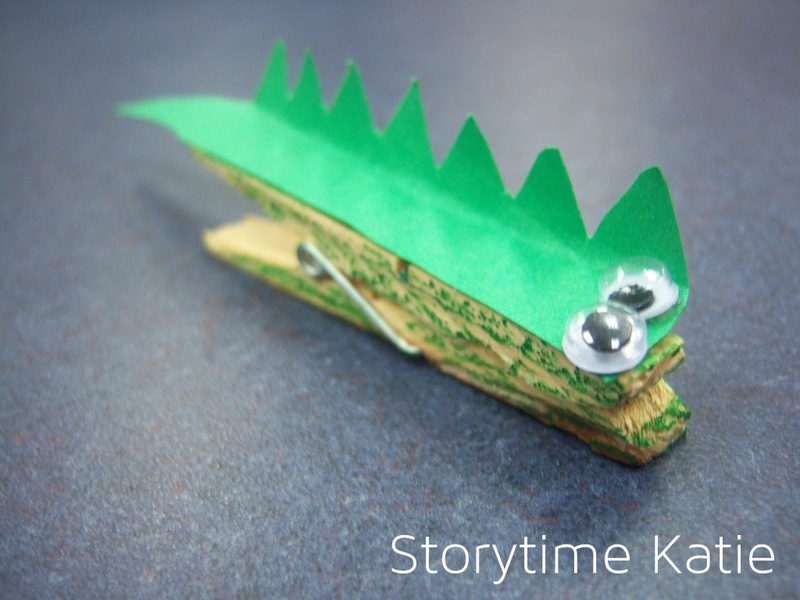 Our craft project was a super simple one that a co-worker had used for her K-3 dinosaur program — clothespin dinosaur! Super easy. I glued the eyes down ahead of time; teen volunteers cut out the dinosaur shape. All the kids had to do was color and clip!